Jacob Leachman, associate professor in the WSU School of Mechanical and Materials Engineering, and graduate student Carl Bunge, in the Hydrogen Properties for Energy Lab. A Washington State University research team has received a $2 million grant from the U.S. Department of Energy to test a new technology for liquid hydrogen fueling facilities. The researchers, led by Jacob Leachman and Konstantin Matveev, associate professors in the School of Mechanical and Materials Engineering, will be working with Plug Power Inc., a leading hydrogen fuel cell system manufacturer. Hydrogen fuel cells are a promising clean energy technology. Similar to batteries but fueled by hydrogen, the fuel cells produce electricity without harmful emissions. Their only waste product is water. Hydrogen fuel is commonly cooled to very low temperatures and converted to a liquid for storage and transport in insulated tanks. The WSU researchers have been developing a way to cool hydrogen that is more efficient and less expensive than current technologies. Led by Leachman, who began studying the challenge as a graduate student, their work is focused on a patent-pending device, called a Heisenberg Vortex Tube, to separate the compressed gas into hot and cold streams. Leachman modified existing vortex tube technologies by adding a hydrogen catalyst as a liner inside the tube. “The process helps cool hydrogen down more rapidly than a standard vortex tube and is more efficient,” he said. 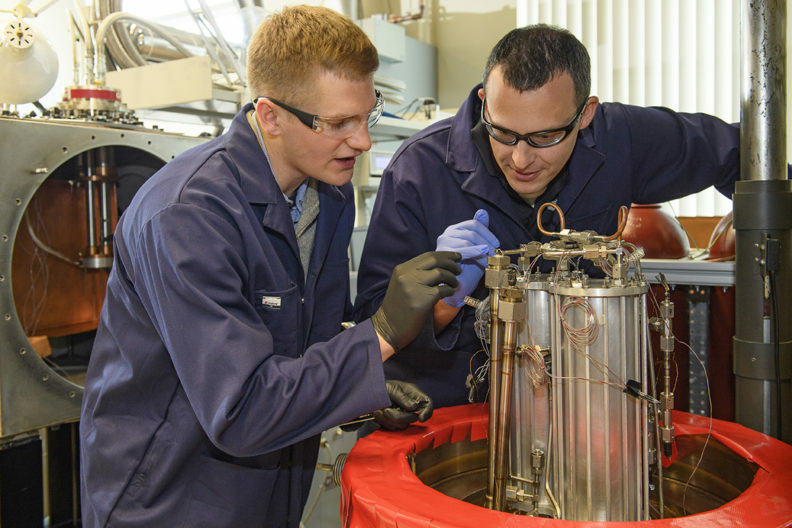 As part of the new grant, the researchers will be working with Plug Power to improve the efficiency of liquid hydrogen storage systems, using excess hydrogen at Plug Power facilities that is currently going to waste. The company builds hydrogen fuel-cell powered forklifts and other material handling truck fleets that are used in warehouses. “It is really exciting to be in a place where real companies in the state can benefit from using our technology,” said Leachman. The researchers will work with real-world data and simulations to experimentally validate models at very cold temperatures in WSU’s Hydrogen Properties for Energy Research (HYPER) Lab. With expertise in computational fluid dynamics of marine vehicles and advanced energy conversion systems, Matveev will study thermofluid processes in the hydrogen-filled vortex tube to optimize the shape of the device. “The challenge is to make sure the technology can be implemented well and result in cost savings for Plug Power,” said Leachman.